The mechanical properties of the composites were determined to find the optimum ratio between the recycled plastic and sawdust powder. Sawdust of particle size 450μm was incorporated into recycled low density polyethylene water sachets at 20%, 30%, 40% and 50% loading by weight. The compositions where then compression molded into tiles. Tiles produced were tested for hardness, impact strength and compression set. Results obtained showed that hardness increases with increase in filler loading while impact strength and compression set decreases with increasing filler content. Hence, the floor tiles produced have desirable physical and mechanical properties with marketable potentials. The project stands as a base for the production of quality products such as floor tiles and hosts of other innovative products which serves as a means for establishing a self-sustaining enterprise and at the same time, convert waste to wealth.
. Adhikary, Kamal B., Shusheng Pang, and Mark P. Staiger. "Dimensional stability and mechanical behaviour of wood–plastic composites based on recycled and virgin high-density polyethylene (HDPE). "Composites: Part B, no. 39 (2008): 807–815.
. Augutis, V., Gailius, D., Balčiūnas,G. "Testing system for composite wood based strips. "Measurement Technologies Laboratory (Faculty of Telecommunications and Electronics),Issue 285 (2004).
. Beg, M.D.H., and K.L. Pickering. "Reprocessing of wood fibre reinforced polypropylene composites. Part I: Effects on physical and mechanical properties." Composites: PartA, no. 39 (2008): 1091–1100.
. Bengtsson, Magnus, and KristiinaOksman. "Silanecrosslinked wood plastic composites: Processing and properties." Composites Science and Technology, no. 66 (2006): 2177– 2186.
. Bledzki, Andrzej K, and Omar Faruk. "Extrusion and injection moulded microcellular woodfibre reinforced polypropylene composites." Cellular polymers journal 4, no. 23 (2004): 211-227. Investigation into the use of cow bone powder as a filler mainly for the production of shoe sole was undertaken. The bone particles were crushed and sieved using a 120um sieve mesh size. For reinforcing effect, the cow bone particles were filled in the natural rubber matrix during compounding and cured. Varied weights of the powder were used and the mechanical properties of the composite were compared with those of carbon filled composite. The results obtained were promising as the properties are close to those of carbon filled rubber. Thus, bone powder can be used as a replacement for carbon black.
. Hepun, C. (1984) Filler Reinforcement of Rubber, Plastics and Rubber International, Hamser Publisher Nurich Vienna New York.
. International Carbon-black Association Retrieved 2009-04-14.
. ASTM 1415 Method for Testing Hardness of Rubber (1983).
. Beyers J.T. Basic Elastomers Technology: filler B Non-Black in Baranwal KC, Stephen HL. Editors. Akron. The Division american Chemical Society 2001, p. 82-111. For economic development to take place in any society there must be development plans and programmes that should be run. The programmes usually are made of projects that have specific deliverables over a given time and have specific financial budgets (financial resources) attached to them that are usually limited. Project implementation is a concept that has taken the centre stage of government development plans in Kenya today. The concept of procurement practices is not very new in Kenya owing to the fact that the country has been heavily benchmarking from the Organization for Economic Cooperation and Development (OECD) countries that have perfected on the idea behind proper contractual management and procurement practices. Despite the fact that there are a number of seminars and trips that have been funded by the government for the Ministry of Finance to come up with clear rules and regulations for standard procurement among government agencies, there is still a violation of the procurement practices to or over the tune of 39.89% nationally and to or over 47.1% within the counties, leading to delayed or failed project implementation. This therefore necessitated such a study. The study was therefore carried out with the aim of examining the influence of procurement practices on the implementation of county government development projects: a case of Kilifi County Government in Kenya. This study adopted a descriptive research design. The target population was 388 respondents. The sample size was 104 construction workers plus the other categories that totaled 147 respondents. From the results: Majority (80%) of the respondents supported the idea that procurement planning has an influence on the implementation of county development projects; majority (90%) of the respondents supported the idea that supplier selection has an influence on the implementation of county development projects;majority of the respondents agreed that the procurement monitoring and evaluation practices influence the implementation of development projects. Researcher concluded that: procurement planning; supplier selection; procurement monitoring and evaluation; and contract review have an influence on the implementation of development projects run and implemented by the county government of Kilifi. 1]. Abdi, A.H. (2012).Procurement practices in Kenya Public Corporations and the performance of projects, A Case study of Kenya Power. Retrieved from University of Nairobi, MBA Library University of Nairobi.
. Awino, Z.B. (2014). An empirical investigation of Supply Chain Management best practices in Large Private manufacturing firms in Kenya, University of Nairobi Bose, D. (2014).Inventory Management. 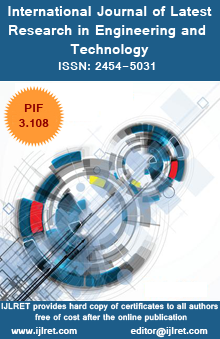 New Delhi, India: Prentice Hall.
. Boudijilda, N. &Pannetto, H. (2014).The European Public Procurement Initiative and Standards for Information Exchange. Journal of Management Science, 7(2), 651-874.
. Brown, B., &Hyer, N., (2014); Managing Projects: A Team-Based Approach, International Edition, Singapore, McGraw- Hill. An investigation of the natural frequencies and mode shapes of the woodworking shaper’s saw unit is presented in this study. This study is done on the base of a mechanic-mathematical model for investigation of free torsional vibrations of a woodworking shaper’s saw developed by the author. The main features in the construction of a kind of wood shapers are rendered an account of this model. The two most commonly used driving mechanisms are modeled – with a wedge belt and with a ribbed belt. The studies allow a comparison of the vibration behavior of the mechanism for both drives. The results of this study allow the determination of the resonant work regimes. The exactly determination of these regimes is important for introduction of adequate measures which can guarantee their using. The investigation`s results can be used as a base for making some recommendations concerning the increase of reliability of the woodworking shapers as well as the accuracy and quality of their production.
. Amirouche F., Fundamentals of Multibody Dynamics – Theory and Applications, Birkhäuser, Boston, 2006, 93, 256.
. Angelov, I. V., Slavov, V. R., Book of problems. Matrix mechanics - Dynamics, Avangard Prima, Sofia, 2010, 42, 176.
. Barcík, Š., M. Kvietková, P. Aláč. Effect of the chosen parameters on deflection angle between cutting sides during the cutiing of aglomerated materials by water jet. Wood Research, 56 (4): 2011, 582, 626.
. Beljo-Lučić R, V. Goglia. Some possibilities for reducing circular saw idling noise. Journal of Wood Science, 47(5): 2001, 390, 493.
. Coutinho M., Dynamic Simulations of Multibody Systems, Springer-Verlag, New-York, 2001, 76, 324. China's soybean futures market is not mature, and there is a large space for development. In this paper, by using data statistics, on March 10, 2017 - March 21, 2018, during the 253 session of soybean (mainly is to use yellow soybeans futures close no. 1 and the relationship between the closing price of soybean meal, soybean oil were analyzed, and found that soybean futures price fluctuation is short time severe problems. In the face of this situation, government departments should be prepared to monitor the full risk of the supply of soybean stocks, and the market participants should be prepared to respond to market risks.
. Hamao eta.l,Bae and Karolyi ,Lin eta.l. Contemporary Studies in Economic and Financial Analysis[J].Economics,2005(86):139-166.
. Shea. Brief introduction of the relationship between Chinese soybean futures market and international soybean futures market -- empirical analysis based on VAR model [J]. Heilongjiang science and technology information.2008, (02):83-84+4.
. Zhou ying heng, zou Lin gang. Research on price relationship between China soybean futures market and international soybean futures market -- empirical analysis based on VAR model [J]. Agricultural technology economy. 2007,(01):55-62.
. Wang xiudong, liu bin, yan yan. Analysis on the price fluctuation of soybean futures based on ARCH model [J]. Agricultural technology economy.2013,(12):73-79.
. MAO chunyuan, liu pingping. Empirical study on soybean futures price based on multiple GARCH models [J]. Journal of huaihai institute of technology (natural science), 2016, 25 (02):53-58. Simplistic, effective, and surfactant-free hydrothermal method was developed and employed for the synthesis of ZnO nanoparticles. In this work, hydrothermal method was used to prepare ZnO nanoparticles at 4h hydrothermal reaction time. The morphology, microstructure and optical properties of the prepared ZnO nanoparticles were investigated. XRD, TEM, HRTEM, SEM, FT-IR and UV-VIS photometry measurements were employed as a characterization analysis. XRD and FT-IR results confirm obtaining ZnO nanoparticles with hexagonal structure. XRD showed that the crystallite size of ZnO is 11.9 nm. The obtained ZnO has relatively high absorption coefficient in the visible region with direct energy gap of 3.11 eV, which indicates that this material can be used in photovoltaic applications. P. M. Aneesh, K. A.Vanaja, M. K. Jayaraj, “Synthesis of ZnO nanoparticles by hydrothermal method”,Nanophotonic Materials IV, Vol. 6639, 66390J, (2007);DOI: 10.1117/12.730364. Qiuxiang Z, Ke Y, Wei B, Qingyan W, Feng X, Ziqiang Z, Ning D, Yan S, “Synthesis, optical and field emission properties of three different ZnO nanostructures”, Materials Letters, 61, 3890, 2007. Chen D, Jiao X and Cheng G. “Hydrothermal synthesis of zinc oxide powders with different morphologies”. Solid State Commun 2000; 113: 363-66. Peaton SJ, Norton DP, Ip K, Hero YW and Steiner T. Recent progress in processing and properties of ZnO. SuperlatticeMicrost 2003; 34: 3-32.